The big gyp of the year and yet audiences are endlessly shelling out cash to see it. 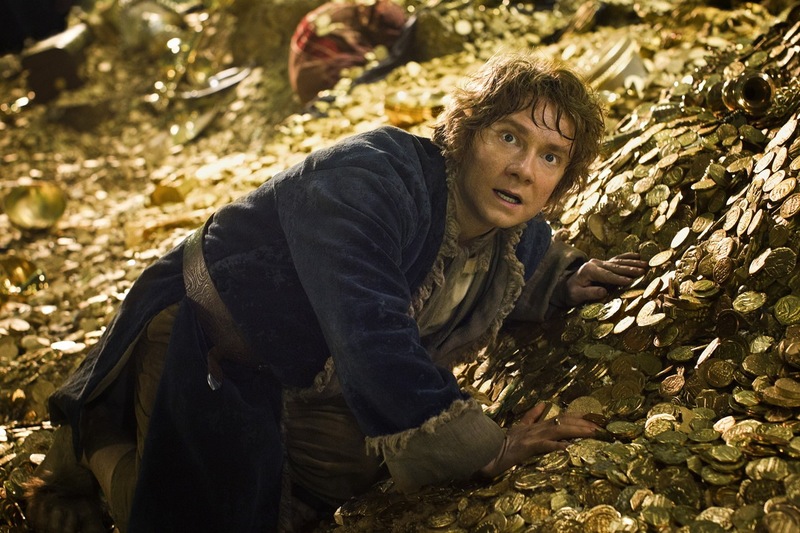 The Hobbit: The Desolation of Smaug is one that I’ve caught up late to – a nearly three hour excursion that goes nowhere. It meant nothing to me. On so many levels it meant nothing to me — does this Middle Earth adventure even have themes? I’m talking about clear, concise themes? Not to say the least that it ends on a cliffhanger that doesn’t deliver any foreshadowing – no, it just ends. That comes after endless epic padding, meandering trek and search scenes that intermix with jabbering yet feeble dialogue. Worst of all is Thorin (Richard Armitage), the leader of the pack, who makes ungainly decisions that put his dwarf-disciples at risk time and again. Bilbo (Martin Freeman, benign is the word for him) is our hero, by the way, and we follow him because he has a nice and trustworthy face. He is a hero of nerdy goodness, gathering courage and wisdom as he goes – but I wouldn’t call him smart. Bilbo, by the way, puts the magical “ring” in his pocket, and then gets in predicaments that will result in the ring falling off his person. The listless thirteen hobbits, are dwarves, first go through a forest infested with predatory creatures because they don’t want to go around it. They get caught, are held up, and leads to a nice chase scene of the dwarves riding barrels down the river while dodging bows and arrows – the cascading choreography is so terrific that it picks up the energy missing from everything else. Tauriel (Evangeline Lilly) and Legolas (Orlando Bloom) are on the tail of the hobbits, but then are allies, too. Tauriel and Legolas are cutesy in a coy way, less coy than annoying really. 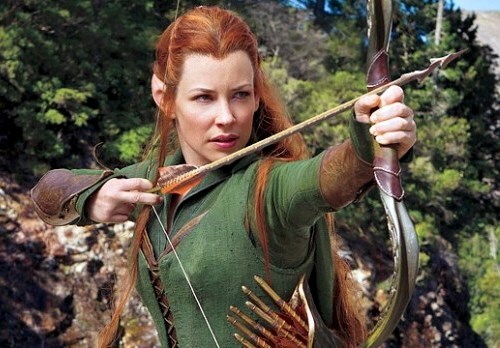 I wonder who Tauriel’s dermatologist is, though, since she is the only person with great flawless skin. It confounds me no other characters wonder how her skin is so good. Much scenery is to be had of New Zealand where it’s been filmed (just like the “LOTR” trilogy), but it’s not like any of the imagery lingers – it’s all so fleeting and evaporate as filmed by Peter Jackson. 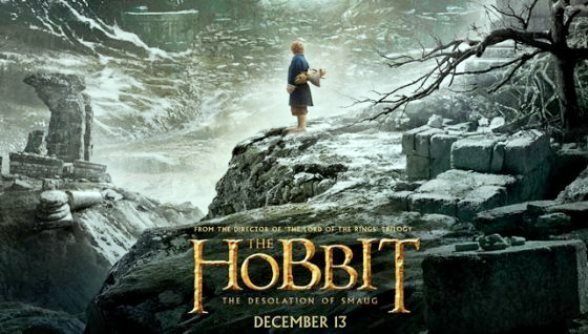 The emphasis of the film is the encounter with dragon Smaug (voiced by Benedict Cumberbatch), which is an endless hide and seek duel – a tease. Bilbo is there to get the precious arkenstone, but you forget what the hell that is by the time the dragon has chased him under viaduct after viaduct. The Hobbits enter the lair to help out Bilbo, but get nothing accomplished. I can’t get over Smaug’s glowing belly! It’s like those wizards and warriors style video games where the level boss has a glaring weakness, but here, none of the Hobbit fighters are smart enough to go for the belly! By 2015, we will finally wrap this hole “Hobbits” thing up when the final installment is released. Thus far, audiences have been bamboozled by this epic tedium. Is the gearing up for the final pay-off of part three been what has attracted audiences? We’ve stared at big epic-y things with swirling camera moves in these movies, and for some reason that’s been enough for some. With Ian McKellan in token scenes as Gandalf. Based on the J.R. Tolkien novel. Film Cousins: “Lord of the Rings: The Fellowship of the Ring” (2001); “Lord of the Rings: The Two Towers” (2002); “Lord of the Rings: The Return of the King” (2003); The Hobbit: An Unexpected Journey” (2012).